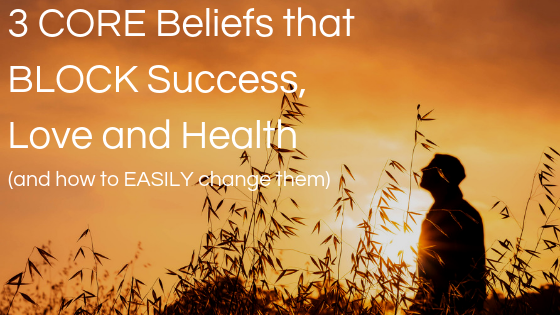 I'm going to be sharing with you the three core beliefs that block success, health, and love. Today, going to be sharing with you those three core beliefs that are blocking you from experiencing success that have a love that of health, and these are the things that people often miss and overlook because this is going deeper. This is going deeper than just the fundamental surface level of what we even call the Law of Attraction, of what we call and when we're focused on our goals. When we're focused on things, when we experienced subconscious blocks and things are holding us back, this is about getting to the core of what we believe to be true because here's the thing. Whatever we believe to be true is reflected back to us. In life, we always get that of a reflection of who we are being and we also always get a reflection of what we believe to be true. The thing is people may be focused on having more money, more success, love, and relationships. But every time they go to focus on it and every time they think about it, they may feel a little bit of resistance within them and they may have beliefs about life in general, even if it's not even beliefs about success are that have relationships or that of health. They may have beliefs about life in general that holds them back. This is about really getting to the core and that's what we're going to be doing today. I'm also going to be showing you that to, of how to redefine these and understanding how to create a shift in your level of consciousness, a shift in your level of identity of how you see yourself. This has also inspired because I'm at the moment creating an experience that's called the shift experience with Aaron Doughty. It's going to be a totally transformative experience where you shift your level of consciousness, you raise your vibrational set point and you start to understand that your whole life has been in reaction to the environment. Your whole life has been stimulus-response. It's an experience that allows you to shift back into a higher level of consciousness which is actually your natural state of being is just that through social conditioning, through life experiences. We get distracted from that. Even as you hear this right now and you're listening to me, you may be thinking, what does this mean? What is he talking about? That's coming from the stimulus-response mindset. There is a shift in consciousness that happens when you start to go from doing and having into being, into being present to the moment. That's what the shift experiences about, so that's something that's being created right now. It will be available within the next few months. If you want to be the first to know about it, you'll see a link in the top of the description box below and all of a sudden you updates as to how that process is going so that you are the first to know. This is something that's inspired me to really look at going deeper and unrewarding things that no longer serve. Because when we do that, we then see that all of the reality changes. The first belief that holds back so many people when it comes to that of success, love, and health, those are the three things people are most focused on. The biggest block people experience with that is that they are attached and they believe that in life they are a form of a victim. There's this victim mentality of things are happening to me. This could be in many different ways, doesn't have to be just relationships or just that of health or just that have success, but in general, when people are identified with that of the world happening to them, this is happening to me. Then what happens is we start to develop a mindset that there's not much empowerment there. I'm not saying this as in a way like the like you should be feeling shameful if you have that victim mentality because I've been there before. I went through experiences growing up where I felt a lot of pain or I felt like I didn't have power, where I felt like things were happening to me. Why did this happen? Now? The most powerful shift I ever made in my life was when I started to look at my past instead of this happened to me too. Everything that happened in my past led me to the person that I became. Even though I went through an abusive experience with my ex-step mom from the ages of seven to 15, and I had no freedom whatsoever. It wasn't allowed to have friends, wasn't allowed to eat very much food, had to work outside all the whole time and I had to earn go into school. Even though I went through all that. That led to pressure to me eventually going through a spiritual awakening. While it was painful at the moment, and while it really bogged me down for a period of time, the moment I learned meditation, I learned how to observe these thoughts and I learned how to transform. The past was the moment my whole entire life changed. That's when I changed and I shifted from the victim mentality to the engaged activity, the engaged part of life. I started to really engage with life in a new way because I realized I could drop that persona. I could drop that victim mentality. Even if you've seen me before, share that scale of consciousness. I'll go ahead and link it right here. The scale of consciousness. Just see that on the scale of consciousness you have the lower emotions such as shame, fear, guilt, anger. I was in anger for a long period of my life because after that I was like, well, I didn't have as much of a childhood because I wasn't even able to have friends until I was 15 years old. And it affected me in so many different ways. And then what happened was I moved, I learned meditation. I moved to neutrality. Neutrality means I observed my thoughts. They weren't good, they weren't bad, they just were, but I was able to reframe the past. When I reframe the past, that's when I let go of all that emotion. I literally felt that emotion leave my body. I allowed myself to then see my past and a completely new point of view and from that moment going forward, I no longer identified with the old perspective of all of this stuff happened to me. Why did it happen? I started to ask myself new questions so I was able to move from this mentality of things are happening to me. Why did this happen to this happened and it made me stronger and that's why I'm able now to help people go through this type of transformation. I'm able to help people to see that because I went through that pain. Maybe if I didn't go through that pain, people would assume that I was just listening titled Guy That I'd never experienced pain or anything in my life, so why would I listen to him? He looks like he's just this entitled Dude, but it's able to see that I've been through it. I've been through things before, had been through it, I've been there, but it's not. It's more about just understanding these different levels of consciousness and understanding that when you get to neutrality, you start to let go of all those lower emotions, so that's about getting to and from that have things happen to me. Two things that are happening for me and moving from the stimulus-response perspective to instead engagement, being present to the moment, observing those thoughts. I'll also say that another thing that really changed my life is when I went from observing. I went from reacting to my thoughts. I was trying to control my thoughts when I first learned meditation and the thoughts that come to my mind and I would think, oh, I'm not supposed to be thinking these thoughts because it was shortly after I learned that if the Law of Attraction, so I'm like, oh, don't want to think negative thoughts. I create resistance. The game changer was when I let those negative thoughts be there. Thoughts are neutral, they are good, they are bad, they just simply are, but we give them meaning and we say, oh, that's a negative thought. I shouldn't be having. I'm going to try more of that in my life or a member. It's more about your beliefs. Create your reality. When I was looking at these thoughts, I was like, you know what? I can see now that they're all neutral thoughts. The only built-in meaning I give them is the is whatever I give them. I was able to observe them, observe them, come in and observe them, go out, and that's when everything in my life began to change. The first belief or the first core belief that we have is that life is happening to us. We start to take our power back when we see that we can engage with life. And that we can then choose to go the direction that we want, but the more that we around relationships, success or health say that things are happening to me is the more we're in victim mentality and think about it when it comes to health. If we think that I'm just big boned, it's the way things are. I'm a victim of this genetics, then we think that we don't have power. If it's in relationships and we think, oh, the opposite or if we think when it comes to relationships, oh, this person, the people that have attracted to just think about me in this way, we have this victim mentality, then that's not very powerful. This is not how I am, then that's a self-fulfilling prophecy. Everything in our life is a self-fulfilling prophecy. I mean, whether we think it's true or whether we think it's not true, it's still going to run our lives. When it comes to these different perspectives, what I encourage you to do is to be aware of whatever the self-fulfilling prophecy is because whatever perspective you focus on, and so it is. I think that just know that whatever you believe to be true is a self-fulfilling prophecy. It's just that sometimes what we do is we allow ourselves to go down the routes of these self-fulfilling prophecies and the let them be an autopilot victim mentality. It's on autopilot. This is the way it is, but remember, it's a self-fulfilling prophecy. The true power exists within you and it exists within the meaning. You give different situations, but if you want to experience a shift in consciousness, it's about going from stimulus-response to stimulation spots. With awareness, because in the moment of you observing what's happening, you can either observe to react to it or you can respond to it and go at it from a point of awareness. In the point of awareness is a choice to engage with life or does the choice to go back to sleep? My night, go back to bed. Just be in the same mindset that we were before. Let's just go back to sleep. Let's be the way that we've always been because things are happening to us. The world is the way that it is, but in actuality is a shift in consciousness is to wake up like in the movie, the Matrix to wake up and understand that everything is on autopilot. Even the things that we have that we say, oh, the matrix, that's a human. We live in a computer simulation. That sounds scary. It's a metaphor. It's a metaphor for understanding that everything is on autopilot. It's a program. It's just running itself out. The old identity, the victim mentality. We have. This happened to me. Sometimes rural also rewarded for things happening to us. We get injured somehow at school. Then we go around and everyone's looking at us. Everyone's like, oh, giving us attention. Maybe we didn't get attention before. We're getting attention. We're getting rewarded for that of the pain that we experienced, so we start to develop a mentality around the victim mentality. Oh, if I'm this way, then people will love me more. People give me more attention. I didn't get attention before and now I'm getting the attention, but what I'm saying is be aware of payoff that you may be giving from the victim mentality. Maybe they pay off is just that of comfortable comfortability. You just feel comfortable being the victim and how I know this sounds hard. Sometimes people hear me say this and talks about victim mentality like you don't know what it had been through. You understand this, you don't understand that I'm trying to free you from your mind. I'm trying to free you from the identity that's keeping you in the same way of thinking over and over and over again. I'm not the enemy. The program itself is what's holding you back from seeing this. If it's hard for you to see, so right now, as I'm even talking about this right now, you may start to feel yourself shift from this perspective of this identity that maybe you've been carrying around your whole entire life. This is who I am. I'm encouraging you to do is to be present with it. Allow it to be there because that is the belief system that is holding you back. That identity with the way of thinking is holding you back. You are not a victim when you move from thinking that things happen to you to realize that everything happens for you. That's when you could start to create in your life in a powerful way. That's when you can really start to choose because right now choosing is on autopilot. Choosing is on the old identity. That's what a shift in consciousness is about is shifting from that old identity, the payoff that you get from being some certain type of way and then shifting in reaction to that of engagement, being engaged with like choosing things and that's where things really begin to happen. The second core belief that people have that really holds them back with success, with relationships, with that of feeling love, feeling worthy and health, is that of needing to be right, needing to be right. People will die to feel right, to not go against their own beliefs or not to go against breaking down their own belief system, but here's the thing. While it may be that the ego always wants to be right, the world is the way that it is. Understand that anytime we say the world is the way it is, thinking that things are fixed, things are not fixed, the reality is not fixed. When you believe reality is fixed, then you will experience a fixed reality, but that is just a self-fulfilling prophecy. Once again, the more we pay attention to the logical construct of the way things are is the more we hold that in place. Let me ask you a question. Maybe some things haven't been working as much. Understand this. This is, this in itself is part of the shift in consciousness. It's not about what is right or what is wrong or is it a reality fixed. It's about what is working. Does this work? Is this efficient? That's the new thing, the APP, because this is a thing, whatever you focus on, you will find evidence of you want proof of that. Go over to Google right now. Type in something random. Type in the cure to this is, is this like the cure to being sick is drinking salt. You will find evidence online that the cure to never getting sick again is drinking salt. Guarantee it, you'll find somebody who has an article about it. You can think of something else random and there's a spin on anything that you focus on. Anything you focus on, you'll find evidence of. This is about being aware that all truths are true. There is no becoming right because becoming right is about the ego's perspective. That once again is the stimulus-response, the stimulus response, and until we break down, those beliefs will continue to experience that over and over and over again. All girls are this way, all guys are this way. Those are fixed mindsets, fixed beliefs. You'll be going to go around, you're going to see evidence of it. Is it true? It's what you focus on that becomes true. It's the perspectives that you might be attached to. What I'm saying is with these perspectives, understand all truths are true, which also means that unless you agree upon it, then it will be true. Everything that I'm telling you right now can be true. It can be not true. It'll pin on her despite your perspective. What have I told you? Everything that I've told you on my YouTube channel up until now is in truth. As I say that right now, the ego might get a little bit flared up people. What do you mean? You mean everything isn't true. What I'm saying is it's only a true if you agree with it and you will only agree with it if it resonates with you, if it resonates with your belief system, if it resonates with your prior reference experiences. My intention with the shift experience is to help you shift from understanding the agitated ego to understanding all truths are true to deciding what is true for you. Don't take my word for anything because 99 percent of what I'm talking about is an intellectual idea. It's a concept that you can hear right now, but you've never actually experienced a concept. You've only experienced an experience. Let me kind of reframe that a little bit different way. Almost everything that we identify with is an intellectual idea. When I only six years old, I experienced social trauma because I peed my pants in front of the class. You did not experience social trauma. Social Trauma is a label. It's a word. All that happened with something happened and now there's this label in the mind that you experienced in social trauma. All of that happened. The story that you tell yourself is running your life now because of something that happened. All that happened when you were six years old are you peed in your pants. That's it. That's it. End of story. But we give meaning to it. Oh, that's embarrassing. Other people laughed at it. This is a story that we've now acquired with this whole process, so therefore the social traumas now influencing the way that you talk to every single person you talk to because it's underlying and subconsciously there. Do you see what I mean? This is about a shift in consciousness. Shift in awareness, moving from needing to be right, always seen evidence of that which our ego thinks is right to breaking apart the ego. Understand that it's not about being right or wrong. The ego wants to be right or wrong. You see, in a way, our life is like a video game. Our life is like that because the only meaning that there is in life is the meaning. We give things. Things are all neutral ideas whether we think we can and we think we can't rewrite. You know the old Henry Ford saying, this is about being aware of whatever you believe to be true because it will be reflected back to you, but remember, it's not about being right or wrong. Understand that there is no fixed reality. We have been preprogrammed or programs from a very early age to look around, to look at the media, to look to external circumstances for validation and for understanding and noticing how the world works, but maybe just maybe if we let go of those preconceived notions, we start to experience more. Don't take everyone's word for it. Understand that the only thing that is real in your life is an experience and even what I'm telling you right now, that's why I'm creating the shift experience. This goes beyond concepts. It goes beyond thoughts. This is something that can only be experienced to really be something that allows you to then shift not this intellectual idea that I shifted. I not shift. That's still coming from the ego. That's still coming from the old perspective, so whether it's a success, health for love, whatever it is, if you believe there's a fixed reality around each of those things, then you will experience that. I need to believe I am in a relationship. I'm not saying any of that. Just let go of what doesn't serve in experience life, because in the experience of life, you will let go of those things that don't serve. That's where the power really is. The third belief that holds so many people back. The third core belief from health, from success, from love, is that people believe they are not enough. It's about worthiness. I want a relationship, but I don't feel worthy of one. I want more money, but I don't think I'm worthy of more money. I want to be healthy, but I don't think I'm worthy of being healthy because my mom or this or that, they were sick. Why should I be healthy or why should I have that ability or my genetics, whatever it is, whatever story we tell ourselves now understand that the reason we don't feel worthy is that we've always looked outside for validation. We haven't learned to go with inferring validation. We haven't learned that it's not. It doesn't matter. We don't need other people's validation. We don't need other people to agree with us. It's more so about how do we feel about ourselves. This is the change that begins to happen now for us to create this change. Thinking about it, we walk around as an energy field. We have an energy field around your body. The Heart Math Institute has shown this. What happens is in a moment, something happens in our past, maybe were five or six years old or eight years old, and it usually's younger than 12 years old, something happens. Our parents' divorce, let's say that that's a lot of people have experienced. Our parents divorced. My parents divorced when I was five or six years old. Imagine your parents’ divorce, and in a moment when you're young, you decide that they probably divorced because of you. That's just what you think. Maybe not. Maybe it's true, maybe it's not true, but that's the belief that you may have and having that belief, you then start to give things meaning that you aren't worthy. You started to give things, meaning that you feel guilty for that, that you feel like you're not enough and you start to experience this disruption in your energy pattern because you start to identify what's happening. You're five or six years old, you don't know all of this stuff and you're just. You're just experiencing that and then what you do is you may repress it. You may suppress that emotion. It really feels it because it's painful, and then what happens is your whole entire life, you go around with this disruption in your energy field that's there because of the meaning you gave that situation when you're a five or six years old and because you haven't actually felt it yet. Here's the thing, most people would look at that and go, once I'm aware of it, I just let it go. Well, the actual key to this is to be aware of it and to relive that experience, to allow yourself to feel that experience because in the feeling of it is it then processing going through your energy field and then you really let it go. Some people call this the completion process. There was a guy or is an ancient Nithyananda or something in India that founded this concept called the completion process or the completion technique. And it has to do with understanding that when we relived these emotions when you relive these feelings, we then allow them to dissipate throughout the energy field. And it does work is very powerful. Here's the thing to make this something easy for you. What I did is I created a free meditation. It's a YouTube video that you can watch. It's the longest YouTube video I've ever done. It's also the best meditation I've ever created. It is the deepest meditation I've ever created. There are two layers to this. One you will experience and go through and remember these different memories. Even if they feel blocked right now, I help you to remember what those memories are. Then what you do is you relive them. You let them be okay. You let them flow through your energy field and then you're flooded with unconditional love. Through this meditation that I've created, it's a 40-minute-long meditation or no for the minute on videos, probably like 25, 30-minute meditation is the most powerful when I've ever created and it is free on YouTube. I'm going to link it below as well. Watch that video after this, work through those things. When you work through them, it will totally transform your life because then you go from believing that you're not worthy of knowing that you are worthy. You see, we have all these rules in our mind that says, what does it take for us to be worthy? We normally think that we're not worthy and we need to do all of these things to be worthy. Those are rules that we set in her mind that said, when x, y, or z happens, then I can be happy. Then I can be worthy, but what I encourage you to know is that you can let go of those rules. You are worthy because you exist, period. That's it. You don't need any more than that to say that you're not worthy would be to be doing with existence itself. If you have a purpose, if you're here, then you have a purpose and you're worthy. Everything has a purpose to trees have a purpose. Animals have a purpose. Everything has a purpose, so when you're aware that everything has a purpose, that you have a purpose, you can see that there's an. There's a purpose for you being here. You are worthy, there's something special about you. You exist and that's that. That's it. You don't need any other rules. You don't need the things you have to do. You don't need to become a certain amount of success. You could feel worthy. Right now. A lot of people that are extraordinarily successful may not feel worthy. It may be a lot of. There's been a lot of stories of people that are successful or famous celebrities with hundreds of millions of dollars that didn't feel worthy. Robin Williams would be one of those you see, so we can start to become aware that we're worthy because we exist. We don't have to do all these things. We don't need all these rules, but as I said, if you want to experience the most powerful meditation I've ever made, it's going to go deep. It's going to help you to like all these beliefs and understanding so the top or it's in the second link in the description box below. You can go ahead and listen to that. I recommend you listed about 21 days to get the maximum benefit out of it, and I think that it can help you to totally transform your life. Remember that the three core beliefs that you can begin to become aware of are that first off, you are not a victim. Things happen. That's that. You can start to see it for what it is. You just start to use it and transform it by reframing it that then you can realize secondly, the world is not set. Things are not set. Whatever you believe to be true will be reflected back to you. All truths are true. It's not the question of, is this true? Am I right or wrong? It's does this work or does this not work? And then thirdly, realize you are enough. If you believe you're not enough, you'll always be looking for validation. All you have to do is let go of what doesn't serve. You can get to the core of something that happened when you were young, that form that belief, you can let it go and it will totally transform your life.